Happy Thanksgiving is a retro classic design with all the fall and thanksgiving elements. The background is two tones of leaves on a gold background and it features a hand drawn montage / collage of thanksgiving elements. 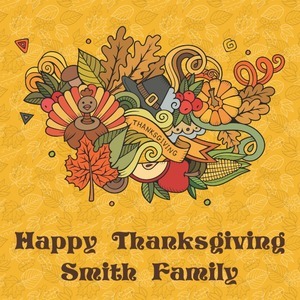 We chose a retro font and personalized it with "Happy Thanksgiving" and "Smith Family" in a fall / thanksgiving dark brown from our fall/thanksgiving color palette. 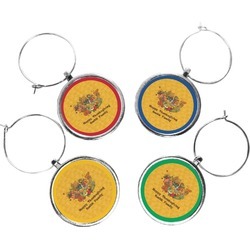 The background is full re-color-able; we chose the golden yellow. We feature our Thanksgiving Montage #2 - we have eight different montages for you to choose from.